And again, it is proven that Israhell rules the US and did 9-11. Court document of 26 May 2011 showing that the Israeli Mossad company that controlled passenger screening operations in Boston on 9/11 has been dismissed from the 9/11 litigation. Why would Donald Migliori and Mary Schiavo, attorneys for the victim's family, allow this to happen? How can it be that the company responsible for allowingallegedarmed terrorists onto the planes is not held culpable for the losses on 9/11? The 9/11 litigation process is incestuous business. 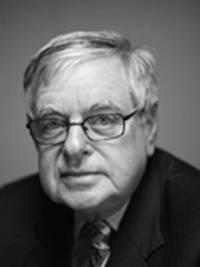 David Werner Sass, a senior partner of the law firm of McLaughlin & Stern (law firm for ICTS), has been a director of ICTS since 2002. Allowing a Zionist judge to administer "justice" has resulted in gross injustices for the 9/11 relatives and the nation. This cannot stand. 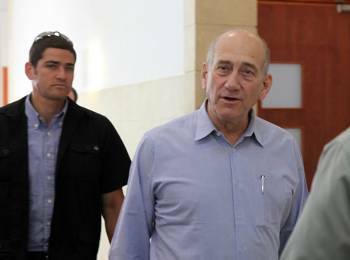 Ehud Olmert, the disgraced former prime minister of Israel and mayor of Jerusalem, iscurrently fighting for his life in an Israeli court. Olmert, a disciple of the notorious Israeli terrorist Yitzhak Shamir, was in New York City on an unexplained secret visit on 9/11. Will the Israeli court ask him to explain the purpose of his secret trip? Olmert, a protege of Shamir, served as minister for minority affairs from 1988-1990 (during the First Intifada) and as Minister of Health during Shamir's regime from 1986-1992. 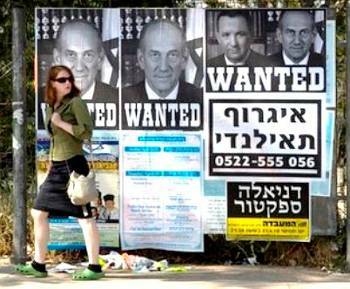 Olmert has a long history of criminal activity and indictments in Israel. He is clearly one of the architects of the false-flag terrorism of 9/11 as can be seen by his secret visit to New York City on September 10-11, 2001. When will we see U.S. authorities calling for Olmert's arrest, along with the other Zionist masterminds of 9/11? Sources close to the 9/11 litigation informed me that International Consultants on Targeted Security (ICTS), the Israeli defendant in the 9/11 terrorism case, was dismissed from the lawsuit last week. This was discussed in a document of 12 May 2011 that indicates that this move was on Judge Alvin K. Hellerstein's agenda for May 16. The Mossad-linked company ICTS had apparently filed a motion to be dismissed from the lawsuit. ICTS is the Israeli parent company of Huntleigh USA, the passenger screening outfit that allegedly allowed armed terrorists to board the planes in Boston on 9/11, according to the official version of events. On 26 May 2011, with the assent of attorneys for the plaintiffs, ICTS was dismissed from the 9/11 litigation. This is completely outrageous, like all the other injustice the 9/11 relatives have suffered in the court of the Orthodox Jew Zionist Alvin K. Hellerstein. U.S. District Judge Alvin K. Hellerstein presides over all 9/11 litigation. As a devoted Zionist Jew, Hellerstein has a fundamental conflict of interest because the key defendant in the 9/11 trial is ICTS, the Israeli company that allowed the armed terrorists to board the airplanes. Hellerstein has a second blatant conflict of interest in that his sonJoseph is a lawyer in a law firm that represents the owners of ICTS. Hellerstein has obstructed justice for the relatives and the nation by preventing an open trial to determine who is truly responsible for the terror attacks of 9/11. 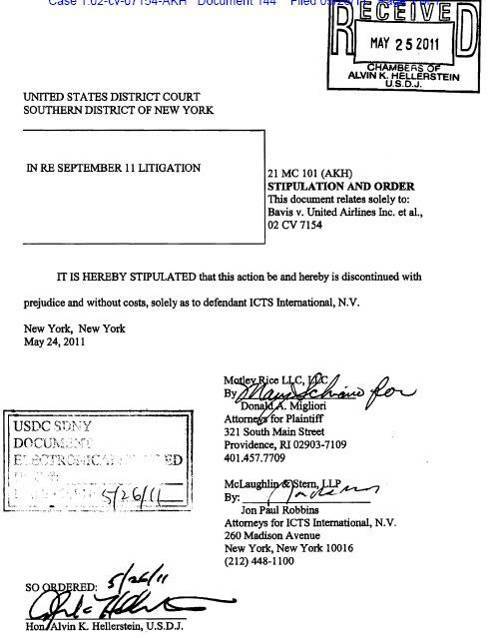 The Zionist judge Alvin K. Hellerstein discussed dismissing ICTS, the Israeli defendant in the 9/11 litigation, as this 12 May 2011 court document from theBavis family case shows. Judge Hellerstein has a clear conflict of interest in the 9/11 litigation. His son Joseph is a lawyer in Israel withAmit, Pollak, and Matalon, a law firm which represents the Israeli owners of ICTS and Huntleigh USA. 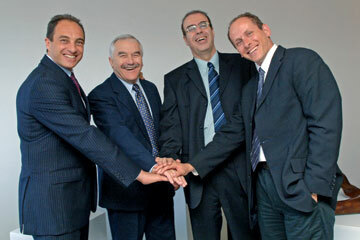 In 2001, ICTS was run by a team of Israelis including the Harel brothers, Boaz and Ezra, and Menachem Atzmon. Atzmon is a convicted Israeli criminal who was involved in illegal fund-raising for the Likud party of Ehud Olmert, Ariel Sharon, and Menachem Begin. Olmert was in New York City on the eve of 9/11 and probably remained to observe the crime. 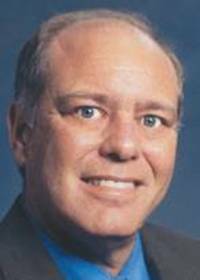 Ezra Harel "died" at age 53 on a yacht off the coast of Spain in November 2003 after being indicted with his father Aryeh Mualem of serious financial fraud in Israel. Ezra Harel reportedly owned a 65 percent controlling stake in ICTS when he left the scene. ICTS had a harder edge from its very beginning. It was founded in 1987 by former security officials of Israel's El Al airlines and bought in 1994 by Leedan, a Dutch investment holding company owned by two brothers, Ezra Harel and Boaz Harel. The former commander in chief of the Israeli air force, Amos Lapidot, is still on the board. The following list is the directors and executives of ICTS in 2002. Nissim is not just an older partner with the Harel brothers, he is one of the key players in the 9/11 false-flag terrorism with other members of the Betar (Zionist militia) from China. Shaul Eisenberg, Mossad's mega-agent in China and Japan, was also involved with the Betar brigades in China in the 1930s and 40s. Eisenberg is the smoking gun between these Betar Likudniks from China and 9/11. Eisenberg owned Atwell, a Mossad company that tried to get the security contract for the Port Authority of New York and New Jersey (World Trade Center, airports, harbors, tunnels, etc.) in 1987. Rafi Eitan, Shalom Bendor, and Zvi Malkin were involved in this attempt to obtain the security contract for the World Trade Center. Ehud Olmert's father and uncle were founding members of the Betar brigades in Harbin and Shanghai, China. Matthew Albert Nissim of ICTS was born in Shanghai. The fact that at least three architectural level players in the 9/11 attacks came from the Zionist communities of China suggests that this may be a key link between the masters of terrorism. For more on the Mossadniks who controlled security at the World Trade Center seeThe Architecture of Terror: Mapping the Network Behind 9-11. There is a saying in U.S. courts that the side that gets the most evidence excluded wins. In my trial the Zionist judge excluded all evidence that proved a conspiracy by the undercover police to injure me when they invaded my home in August 2006, and he refused to allow my expert witness to testify on the propriety of the actions taken by the police. On the other hand, Judge Hyman Riebman did not even sanction the police forintentionally destroying the video evidence they had made of the assault, a clear violation of police regulations. He then allowed Michael Barber, the Hoffman Estates police officer who worked with the Department of Homeland Security, to testify on the effects and risks of using a TASER, based solely on information he had been given by TASER International. Furthermore, it was Barber who had tortured me with a TASER while I was handcuffed and pinned to the ground with him on my back and Timothy Stoy kneeling on my temple. On the stand both Stoy and Barber clearly lied about having given a verbal TASER warning, while none had been given. Guess who won the battle in Riebman's court of injustice? 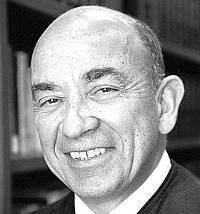 Hyman I. Riebman is the corrupt judge who presided over the seriously flawed Bollyn trial. In the trial for the family of Mark Bavis, who died on 9/11, the judge is now seeking to remove from the trial the Israeli company who was responsible for passenger screening on 9/11. The evidence has already been removed, now Judge Hellerstein wants to remove the culprits. The only remaining wrongful death case is Mary Bavis vs UAL Corporation, et al. This case represents the only 9/11 trial that will ever be held and should be of great concern to all Americans. The flagrant conflict of interest on the part of the judge cannot be ignored. Judge Hellerstein must be removed from the case and a new process begun for all of the 9/11 families who have not been treated fairly in the tort litigation. Amit, Pollak, and Matalon represents BOS (Better Online Solutions), Cukierman Investments, and Catalyst Fund. Edouard Cukierman is Chairman of the Board of Directors of BOS, the founder and CEO of Catalyst Funds, and the Chairman of Cukierman & Co Investment House. Edouard Cukierman (left) is the founder andCEO of Catalyst Funds and Chairman of Cukierman & Co Investment House. Here he poses with his partners Yair Shamir, son of the notorious Stern Gang terrorist Yitzhak Shamir, and Boaz Harel, owner of ICTS with his brother and other Israeli criminals on 9/11. 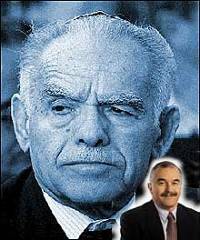 Yair Shamir is the son of the notorious terrorist and murderer Yitzhak Shamir of the Stern Gang. Shamir, born Icchak Jeziernicky in Ruzhany, Russia, served as prime minister of Israel from 1983-1984, and from 1986 to 1992. It was during Shamir's reign that preparations for 9/11 were being made. In 1987, for example, a high-level Mossad company owned by Shaul Eisenberg tried to get the security contract for the World Trade Center. It was rejected when it was discovered that it was headed by known Israeli criminals who had stolen materials to make nuclear bombs from the United States. Why was ICTS, a company run by convicted Israeli criminals, allowed to provide security services in U.S. airports? Cukierman is also Chairman of the Board of BOS, a.k.a.Better Online Solutions of Israel. The following two legal documents show that Amit, Pollak, and Matalon of Tel Aviv is on the record as being legal counsel for Cukierman, Catalyst, and BOS. They include such statements as this, "The validity of the ordinary shares, including the ordinary shares issuable upon conversion of the note and the exercise of the warrants, will be passed upon for us by Amit, Pollak, Matalon & Co., our Israeli counsel." It should be noted that Edouard Cukierman is also "an officer of the Israel Defense Forces Spokesman Unit". This shows his connection to the state of Israel and its military forces. Edouard Cukierman is the founder and CEO of Catalyst Investments and Chairman of Cukierman & Co. Investment House. He is also on the Board of Sar-El, an Israeli Defense Forces volunteer organization. He serves as an Officer of the IDF Spokesman Unit, and is part of the Hostage & Crisis Negotiation Team (Reserves). *** exposing the hidden truth for further educational research only *** CAVEAT LECTOR ***In accordance with Title 17 U.S.C. Section 107, this material is distributed without profit to those who have expressed a prior interest in receiving the included information for research and educational purposes.NOTE: Some links may require cut and paste into your Internet Browser.Please check for daily real news posts and support the truth! (sorry but don't have time to email all posts) athttp://tinyurl.com/33c9yr or http://tinyurl.com/yzbolzuorhttp://groups.yahoo.com/group/ttsarchive/messages; You can also subscribe to the multiple daily emails by sending an email tototal_truth_sciences+subscribe@googlegroups.com; free book download:http://tinyurl.com/2afxwx2;***Revealing the hidden TruthFor Educational & Further Research Purposes only. *** NOTICE: Due to Presidential Executive Orders, the National Security Agency (NSA) may have read emails without warning, warrant, or notice. They may do this without any judicial or legislative oversight. You have no recourse, nor protection.......... IF anyone other than the addressee of this e-mail is reading it, you are in violation of the 1st & 4th Amendments to the Constitution of the United States. Patriot Act 5 & H.R. 1955 Disclaimer Notice: This post & all my past & future posts represent parody & satire & are all intended for intellectual entertainment only. To be removed from the weekly list, please reply with the subject line "REMOVE"